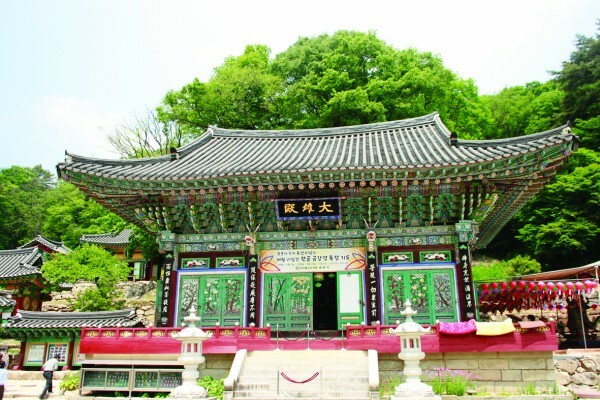 Yongmunsa is believed to have been founded by High Priest Daegyeong in the year 913, in the second year of King Sindeok of the Silla Dynasty. In the vicinity, you can find a monument designated Treasure No. 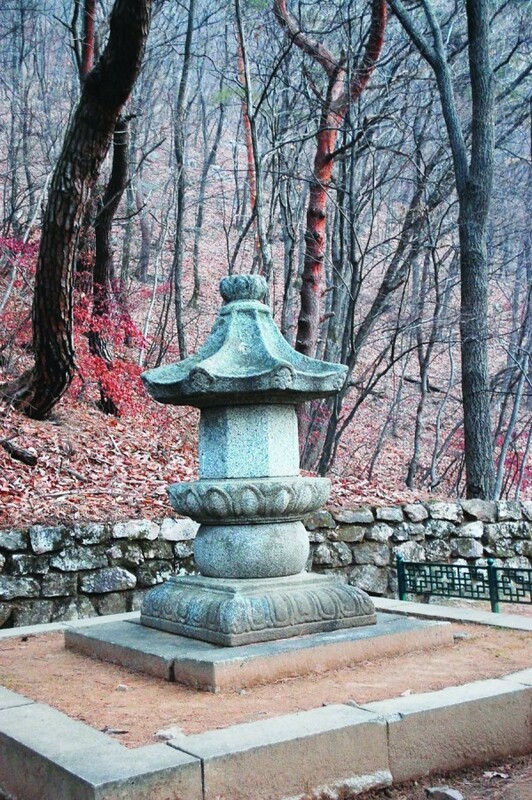 531, as well as the Budo pagoda of National Preceptor Jeongji by Gwungeun; Treasure No. 1790, Gilt Bronze Seated Gwaneum Bodhisattva Statue; and Natural Monument No. 30, the Gingko Tree. This tree stands at 42m tall, and is believed to be 1,100 years old. This female tree, located on the temple grounds, has a large bump on the bottom, and is the tallest fruit tree in Asia. Despite the many wars and fires in this country, the tree managed to survive undamaged. During the Joseon Dynasty, King Sejong (4th King, 1397–1450) awarded it the title of Jeong Sampum. 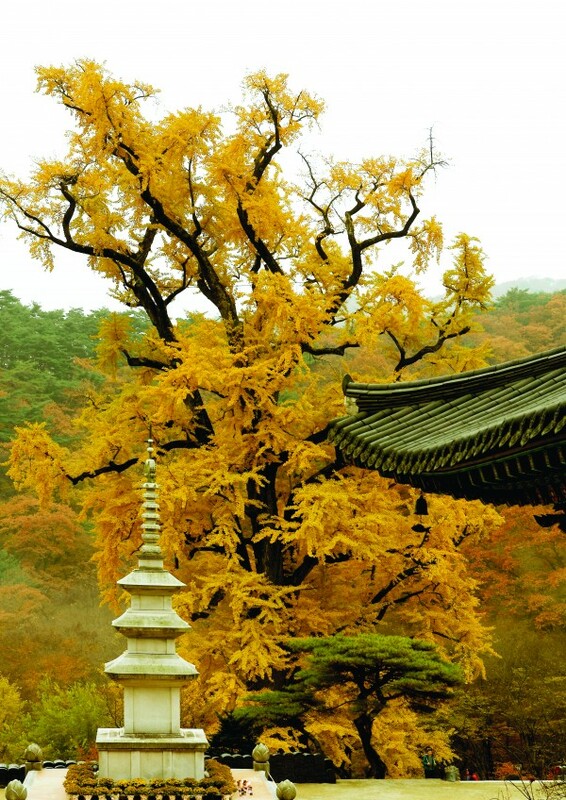 In the fall, a Danju, a small string made of gingko beads, is given to visitors. You, too, can absorb the tree’s strong healthy energy by walking beneath it. 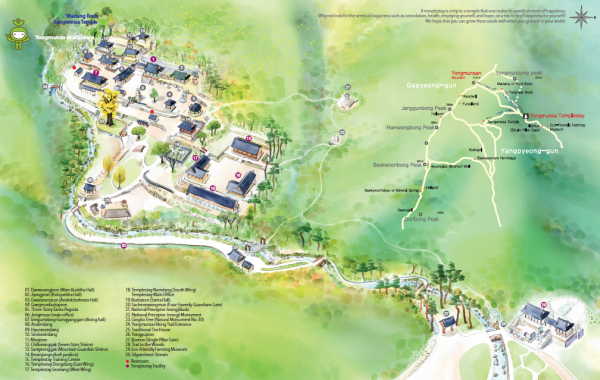 National Preceptor Jeongji entered nirvana at Jeokmyeolam Hermitage in Cheonmasan Mountain, and was cremated in the 4th year of King Taejo (1335-1408), founder of the Joseon Dynasty, in 1395. At that time, many sariras, or sacred relics, remained after his cremation. When King Taejo heard about this, he praised National Preceptor. When you follow a narrow trail on the right of Yongmunsa Temple, and walk 200m forward, you will find this monument. You may feel at ease here. This statue is a key work of the 14th century among the gilt bronze bodhisattva statues of the late Goryeo Dynasty. 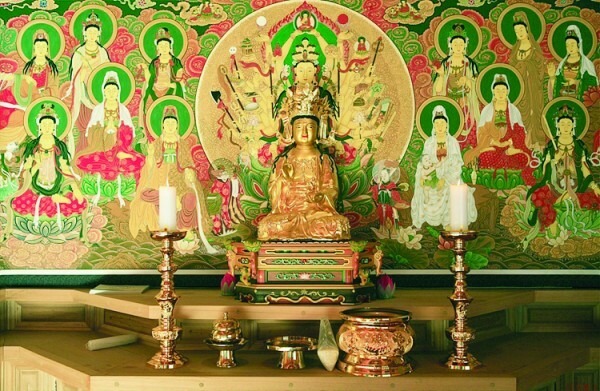 Gwansaeeumbosal, or Avalokiteshvara Bodhisattva, is known for her vow to benefit all beings, hearing their lamentations of suffering and cries for help, and helping to ease their troubles. Thus, an endless prayer is recited by devotees. Why not prostrate three times and sit awhile, taking the opportunity to renew your commitment. This gambrel-roofed structure was restored in 1984. With the Triad-Buddha: Amitabul, the Buddha of the Western Paradise; Gwanseeumbosal, the Bodhisattva of Compassion; and Daesaejibosal, the Bodhisattva of Wisdom and Power for Amitabul, enshrined in the middle, a thousand Buddhas encircle the hall on three walls. As you walk up the stairs to the building, recall the saying “Jabimujuk(慈悲無敵) meaning,” “A compassionate person has no enemy.” You should look into your heart, to see if you can find compassion there. Above the bell is a hanging sign, with ‘Beomjongru’ written in Korean. Yellow gingko leaves are carved on the massive bell. The instruments there, called Beopeo (dharma drum), Mokah(wooden fish-shaped drum), Unpan(cloud-shaped gong) and Beopjong (dharma bell), are played at the time of yebul in the morning and evening each day. 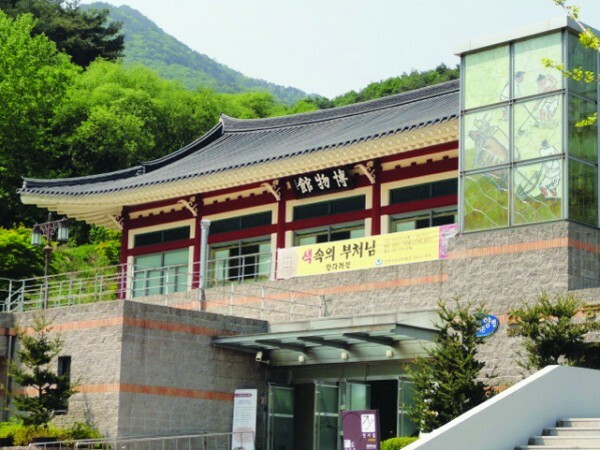 The resonating sound of the bell is said to be the best among the eight attractions of Yongmun. Why not try it, to see if it lives up to its reputation? A monk will assist you in striking the bell. This museum is located at the entrance to the temple. It is also used as the temple food center. After a couple of days staying at the temple, you can have a lunch with mulberry leaf rice here at the center (20 guests or more). The rice is made with mulberry leaves and their broth. When wild edible greens from the local area are added, the meal will make you feel simply healthy.